The Foam Roller by Suffolk is incredibly functional with a multitude of uses. From a massage perspective, the rolling action feels great on tired and sore muscles. But beyond the comfort, the foam roller’s tension releasing capabilities help stretch and ultimately strengthen muscles as well. Use before dancing as the perfect warmup to increase blood flow to muscles and create better flexibility, range of motion, and overall mobility. After dancing, foam rolling helps with faster recovery by reducing inflammation, lactic acid, and joint stress. Other exercises with the foam roller help you improve your core stability. When lying down with the roller placed under your spine for example you can use port de bras and relevé to work on core strength. The uses are really endless! Made of a comfortable foam outer layer with durable hard hollow plastic core. 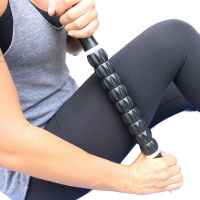 The Suffolk Foam Roller measures 13 inches in length and is 5.5 inches wide.